Gel nails have been around for decades. Originally, gel nails were made using a dental porcelain gel powder. Today they are made with a gel acrylic. They are natural-looking, beautiful enhancements to your real nails. Gel nails are thin, clear and flexible. Since they are so versatile, they can be used for natural nail overlays, tip overlays or they can be sculpted on forms. Gel nails combine a natural look and feel with convenience and durability. If you want to grow out your natural nails, gel nails can become a base coat that protects and strengthens your own nails. Maintenance is necessary but gel nails never need to be removed. Another benefit is that they feel natural because they are so lightweight and flexible. Instead of feeling "fake" the feel like your own real nails. Keep in mind that, while the application steps sound simple, it is difficult to learn how to apply gel nails correctly. Unless you are experienced it is better to leave application to the professionals. First your nail will be prepared by removing any dust and oils. At this time nail tips will be applied if you want them. Once again they will be dusted and cleaned to remove any shine. This is necessary because the gel will not stick to shiny areas. Next, a thin coat of primer is applied to your nail and nail tip if you are using them. Allow the primer to dry completely before proceeding to the next step. Now the first coat of gel will be applied. This coat must be thin and cannot be allowed to touch your skin or the nail will lift later on. Once this coat is applied your nail will cure under a light for one to three minutes depending on the lamp being used. After the first coat has cured a second coat will be added. This coat will be a little thicker than the first. Arches are added by pushing a bead of gel along your nail. The brush should never actually touch your nail; it should rest on the bead of gel and glide across the top of your nail as if it is floating. Once again your nails will now cure under the light for one or two minutes. The third coat is applied more slowly to allow the gel to set up into a gelatin-like consistency. During this step, the stress area across your nail will be reinforced and more arching will be added. Then your nails will cure for another minute or two. Finally your nail will be inspected for thin spots. If it is necessary, additional gel will be added at this time. If more gel needs to be added your nails will cure under the light again. At this point, your nails are shaped and contoured. Finish by buffing until your nails are smooth and add polish or a clear top coat. Nails are first prepared following steps #1 and #2 above. Next, forms are applied with your natural nail extending out onto the form. Filing the edges to even out your nails will not be necessary as they will be evened out with the gel. The first coat of gel is now applied over your nail and out slightly onto the form. After this application, your nails are cured under the light. Silk fiber is now placed from the middle of your nail out past the edge of your nail and onto the form. This adds strength to your nail extension and to the stress zone to prevent cracks and breaks. Cure your nails again. Now the second coat of gel is applied and slight arching is added to your nail. Again, your nails are cured. Forms are now removed, a third coat of gel is added that will provide more arching and your nails are cured again. Usually this is the last coat of gel. 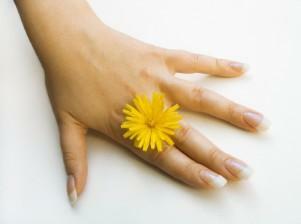 Your nails should again be inspected for thin areas and if needed, more gel will be added and cured. Then you will turn your hands over so your nails can be cured on the other side. Lastly, your nails are filed into shape, buffed and polished if desired. A skilled nail technician can also use gel to create a gloss coat over airbrush designs, among other advanced techniques. Now your manicure is complete. Enjoy your new gel nails!